The school hostel offers a very comfortable, caring and organised life. The environment & facilities in the Hostel building are such that children feel as if they are residing in families. Every child is provided with individual Box-Type bedstead, and wardrobe to keep his belongings properly. The hostel is air-conditioned, fly & mosquito proof and is kept hygienically clean. The common room is equipped with indoor games and recreational facilities like DVD Player Educational magazines, etc. In addition to the wardens, matrons, etc. special house mothers have been assigned to look after the children The life of the children is strictly regulated right from 5:30 a.m. to 10:00 p.m. They have fixed hours for play & studies. At the time of supervised studies in the evening when the students do their home work, teachers are present in the study room to guide them in studies. 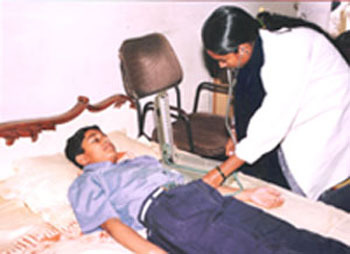 Medical facility is available round the clock to keep the children medically fit. No child is allowed to go outside the campus unless accompanied by a senior teacher. Children are not allowed to bring any food stuff/cash from home. If any food stuff or cash is found with the child, the same will be confiscated. Students are encouraged to write regularly to their parents, the resident counselors will help them, to the extent possible for the same. In Shanti Gyan International School, we teach the child how to do proper things at proper time, like general cleanliness, when to study, when to play, wash hands and clean teeth after meals, learning table manners, learning to respect the elders, behaving confidently and interacting with other children. A big modern mess is operational for serving 300 students in one shift. A wholesome, balanced and vegetarian diet is provided to the students keeping in view of their body requirements on the recommendation of a dietician along with fresh milk.The stress is laid on the quality of the food to be served to the children. To provide a homely and a friendly atmosphere, teachers take their meals with the students. The primary function of the education system is to transmit knowledge and skills which society regards as indispensable for its survival and improvement. The system regulates the knowledge transmitting activity, inculcates the folk ways and moves, trains the young to fit into the established cultural scheme, aims to aid the individual in the development of the personality and aptitude and set’s forth the broad outlines, which the society believes, must he followed, in order to survive and improve. Hostel life, must play a prominent role in achieving the aims and objectives of education and to transform the child so as to fit into the models set forth by the society. The boy’s hostel building is well designed and the students are accommodated in spacious, comfortable rooms providing a ‘Home away from home’. Life in the Hostel begins early in the morning with rouser and warming up, exercises. The students are kept busy with planned studies, school activities, evening games, free time occupations and hobbies. The hostel has spacious common rooms provided with Radio, T.V., Newspaper and Magazines facilities of Multi-Gym, Indoor games Table Tennis, Carrom, Chess are also available. Balanced, nutritious vegetarian diet is provided under the supervision of qualified dietician. Fresh fruits and milk are provided every day and extra special diet is provided on the recommendation of school doctor.